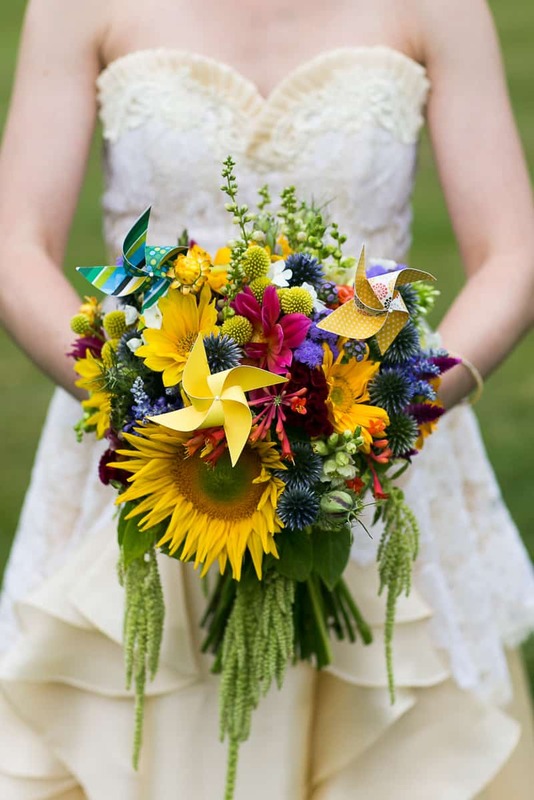 What’s not to love about pretty pinwheels, sunflowers, bright colours and a beautiful ceremony by a lake?! Today’s real wedding has all of these things and so much more! A super-cute pinwheel motif was threaded throughout the wedding– with the bridesmaids swapping bouquets for pinwheels and themed centrepieces, there was even pinwheels shaped cookies as favours! Lauren & Dano’s wedding was an eagerly awaited event for all of us that know them! They’ve been a tight and obviously perfectly matched couple for many years now, so to finally celebrate their union with a sweet and intimate weekend at this gorgeous location in The Fingerlakes was an honor and a joy and I was so thrilled they hired me to capture it for them. Knowing Lauren since our college days at Wesleyan I suspected she would come up with something really fun and different for her wedding decor, and sure enough there was a super-cute pinwheel motif consistent throughout the wedding– pinwheels instead of bridesmaid bouquets, pinwheels sprinked in her bouquet and the centrepieces and even pinwheels shaped cookies as favours! The colors too, were bright and bold blues and greens with some yellows in the flowers. Our mutual friend Ben Simington officiated the ceremony, and he did such a brilliant job I think I need to insist that he take up officiating Central Park elopements back here in the city– he had a fantastic presence and voice, striking just the right balance of humor and focused sincerity, and I mean, what with that beard, well, he really looks the part! The setting of The Fontainebleau Inn was incredible and the weather played nice for the most part– nice enough that we went through with the outdoor ceremony down by the lake near a giant tree. As you can see, Lauren looked incredible in this amazing dress by Leanne Marshall– a perfect fit for the Old Country Inn style setting I must say. And of course what took the wedding over the top for me was an amazing round of moving and hilarious toasts… Congratulations to this fantastic couple– they deserve every happiness! Amazing photos and the view is just paradise. How cool! I love that this couple incorporated wind mills into everything! What a unique idea to add pinwheels, I love it! The flowers are beautiful, love the bouquets and centerpieces.